What do you see flowing from my fully opened kitchen faucet? The correct answer is NOTHING! My water worries began mid-afternoon yesterday when I suddenly lost water pressure. I still had flow, just not very much. With the continued very cold temperatures, I was afraid that perhaps ice was forming in the pipes and impeding full flow. So, I called Christiane first to see if perhaps the water company was doing work on pipes in the village that might impact water pressure. The answer was no, so she sent Jean-Paul to have a look at my pipes. He fiddled around a bit, turning taps on and off, scratched his head, and called Patrick, my landlord. He zoomed down and agreed that this was not normal water flow. He and Jean-Paul worked the rest of the afternoon trying to thaw potentially ice-impacted pipes. Actually, I think it was a good excuse for them to play with Patrick's walkie-talkies as there was brisk French conversation from my kitchen down into the basement! But, they never managed to improve the flow. Patrick put a portable heater in the basement in an effort to warm up the pipes, but told me I didn't need to leave the taps open a tiny bit through the night (which is what I'd do in Iowa when temperatures would plummet). 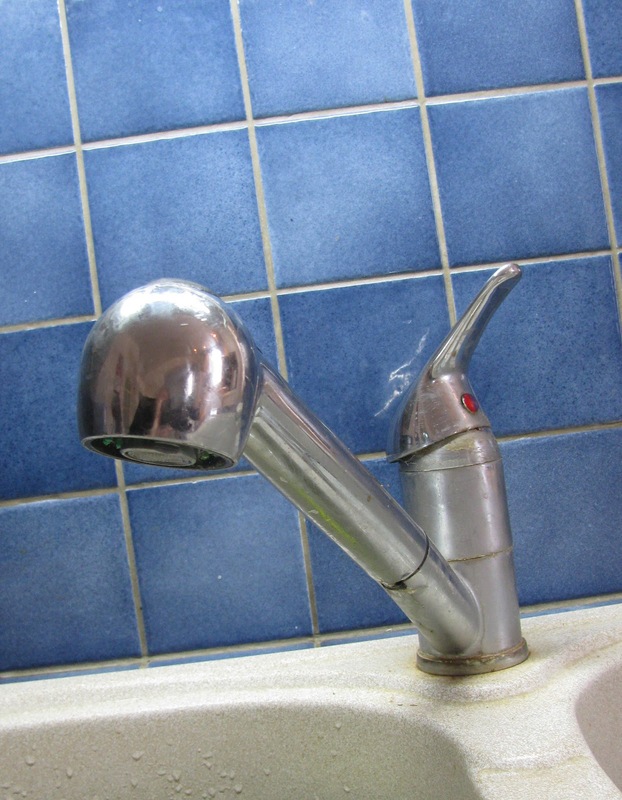 I woke up about 1am and checked the faucets; the flow had decreased dramatically, so I left one open all night. This morning around 7am, the flow stopped completely! I'd prepared for this by running a bucket of water for the toilet and several pitchers and pots for kitchen use, so I wasn't too worried. Inconvenient, but do-able if necessary. Around 9am the phone rang. It was Greg with news from Christiane (who becomes our 'communications centrale' when there is a village crisis). Indeed, there was a leak in one of the large water pipes that serves our village and SAUR was working on it. Thus, no water!. Within an hour or so, the problem was fixed, and the crisis was over. I now have full water pressure....and several pots, pitchers and buckets of water sitting around the house! This is really not a time of year you want to be without water. Someone we know around here has been without water for a week but no one can find the problem! Glad you're back on again. Keep warm! I'm commiserating with you from the Vaucluse. I do have water, thank goodness, but earlier in the week had received an automated phone message from the water company, warning of the potential for frozen pipes. Some of my friends in the area have had that unfortunate experience. It is extremely cold.